Hubbell Realty Company is building the bridge over the Racoon River to connect the Gray’s Station neighbourhood with areas such as local trails. The bridge will be installed over the course of the next seven months. 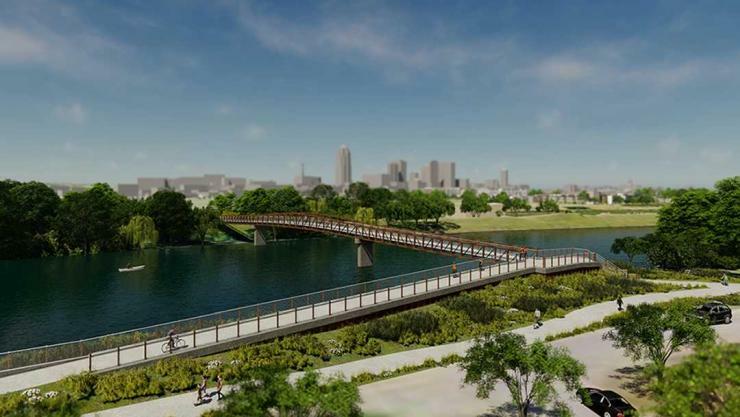 It will feature overlook points along the Raccoon River, as well as an access ramp to the Gray’s Lake, Kruidenier and Meredith trails. An array of lighting will provide colour patterns at night. The bordering wetland park system, constructed by the city of Des Moines, has also started. The will be reconstructed to become a regional storm water amenity. The city will be planting native plants in the basin to help filter the water prior to it reaching the Raccoon River.